Size matters. Don’t let anyone tell you different. Samsung understands this, and has thus tried to build a tablet for just about any size pocket or backpack you may own. We all know about the GalTab 10.1 and 8.9, but today even smaller models join the pack. 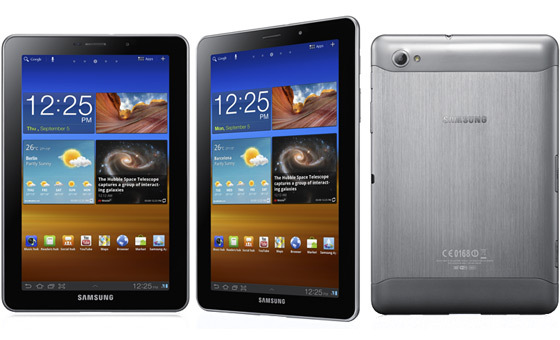 At the IFA conference in Berlin, Samsung today announced the Galaxy Tab 7.7 and the 5.3-inch Galaxy Note. And if some size variation isn’t enough, Samsung has also shaken things up in the design department. Neither of these noobs look very similar to the original Galaxy Tab 10.1. That’s not necessarily a bad thing, seeing that the GalTab is under heavy fire from Apple for allegedly imitating iPad “trade dress.” Either way, these two slates from Samsung are something new, and that’s all we’re ever asking for. The 7-incher sports a Super AMOLED Plus display, which is just about as good as it can get. We’ve got a 1.4GHz dual-core processing chip under the hood, Wi-Fi channel bonding to improve connection and speed, and support for HSPA+. The 5,100 mAh battery is said to offer up to 10 hours of video playback. Pretty impressive for a slate that measures in at 196.7mm x 133mm x 7.89mm, and weighs less than a pound (0.73 lbs to be exact). The slate runs Android 3.2 Honeycomb and the latest version of Samsung’s TouchWiz UX. A 3-megapixel rear shooter comes with auto focus and LED flash (and 1080p video capture), with a 2-megapixel front-facing camera for video chat. The slate comes in 16GB, 32GB and 64GB flavors with microSD card support up to 32GB. The 7-incher’s great, and I’ve always been a fan of this size slate. To me, it is much better than the standard iPad-esque 10-inch form factor when it comes to gaming, as the iPad is just a tad too large to hold with one hand. At least for me. 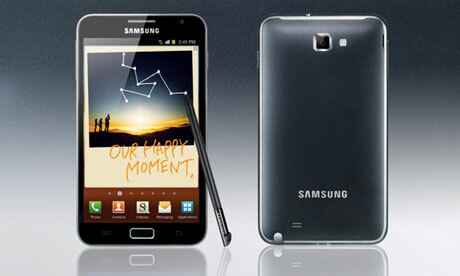 But what’s more interesting is the even smaller Galaxy slate, Samsung’s Galaxy Note. The Note sports a 5.3-inch Super AMOLED display, with overall dimensions of 110mm × 58.2mm × 12.3mm. That’s pretty teeny for a tablet. Like it’s big brother, the Note also runs on a 1.4GHz dual-core processor, but gets bumped down to Android 2.3 Gingerbread instead of Honeycomb. Oddly enough the camera on this little guy is better than that of the 7-inch GalTab, clocking at 8 megapixels in the back and 2 megapixels up front. The rear camera is also capable of video capture in 1080p. The Note also comes equipped with a special type of stylus called the S Pen, which is meant to make it easier to mark down data on the go. Whether that actually holds true is a mystery until we get our hands on the Note and its famed S Pen. The Note has support for HSPA+ and WiFi, but is also an LTE-capable device. Now you might think that a 5.3-inch display is infringing on smartphone turf, but I’m going to disagree and here’s why: Have you ever seen someone talking on the Samsung Infuse? It has a 4.5-inch display, and when held up against someone’s face, it looks kind of enormous. Chances are, smartphone displays won’t get too much bigger than that. At least, we hope not. Either way, these should shake things up a bit in the tablet space. With IP wars raging across the world, differentiation should be a major focus. And what better way to set yourself apart than to create an entirely new size category. If you can’t get enough, we’ve added Samsung’s introductory video for the Galaxy Note after the break.